Ramrodded into its 528 joyous full-colour pages is more information, inspiration and fun than you can shake a clip stick at. From predictably amazing Froggatt sizzlers to whole crags you’ve never heard of – Upper Matlock Quarries, anyone? Big leads on mighty classics to tucked-away ticks on quiet wooded buttresses. From top-level highballs to gentle bouldering circuits. From Victorian tweed-wrecking classics to the latest nerve-testing desperates. The guide has been written by some of the most active locals in all its areas and now you can tap into their special knowledge. No stone has been left unturned in the obsessive drive for top-quality information for this guide. Many routes recorded for the first time, many boulder problems discovered, all the areas gone over with a fine-toothed wire brush, metaphorically speaking. You will never need another guide to these areas again. The photos shine like jewels in this book with great images from the best photographers. Fantastic shots from fantastic crags, but also pictures from many out-of-the-way crags and buttresses to get you exploring. Six ever-popular colour-coded bouldering circuits with plenty of surprises. A series of Editor’s Choice selections. Historical anecdotes and original writing from some of the area’s most important figures. The new F2BR guide lays all these out on a delicious plate Where first-time visitors will find the classics and locals will find endless surprises. Where inspiration and information come together perfectly to give a lifetime's worth of climbing. 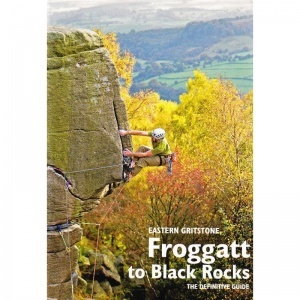 ,100 boulder problems from V0 to V12; 130 action photos; 6 Fontainbleau-style bouldering circuits; Over 300 full-colour andphoto topos Crags: Froggatt, Curbar, Baslow, Yarncliffe; Gardom’s, Birchen, Chatsworth; Cratcliffe, Robin Hood's Stride, Rowtor, Stanton Moor; Black Rocks, Whatstandwell,Shining Cliff, Amber Valley ... and many more besides.